Is there a better alternative to LeanCalc? Is LeanCalc really the best app in Mathematics category? Will LeanCalc work good on macOS 10.13.4? LeanCalc... This is a Cocoa calculator program based on the calc library. 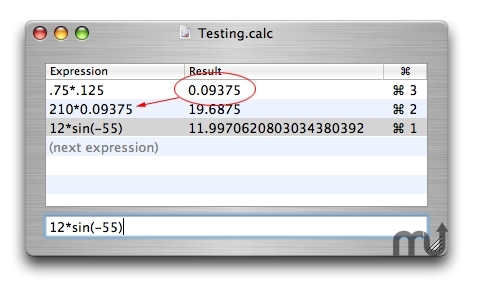 It can be used for simple arithmetic as well as complex calculations, thanks to calc's large built-in function library (check out the reference in the application's help menu). All calculations are kept in a history and you can reuse the results of the last few calculations in the history directly using keyboard shortcuts. Version 1.3 is a minor update that lets you select a result line and use the Copy command to copy the value to the clipboard. LeanCalc needs a rating. Be the first to rate this app and get the discussion started!